An inspiring tale, about an extraordinary woman overcoming staggering adversity to win through in the end. “About 6:20am on Friday 18/8/00 vehicle 1 was driving south on Old South Head Road approaching Curlewis Street at Bondi. Vehicle 2: the pedestrian was proceeding south on the foot path on the eastern side of Old South Head Road. The pedestrian started to cross over the pedestrian crossing on Curlewis Street. At the same time, vehicle 1 turned left and collided with the pedestrian who was on the crossing at the time. “Vehicle 2” is 23 year-old Clare Sultmann, an athletic law graduate on her usual morning jog in Sydney’s Bondi Beach, struck by a truck on a pedestrian crossing. Miraculously she is alive, but horrifically she is vividly conscious throughout the entire ordeal. After waking from an induced coma three days later at St Vincent’s Hospital and lucky to be alive, Clare is told of the severity of her situation. 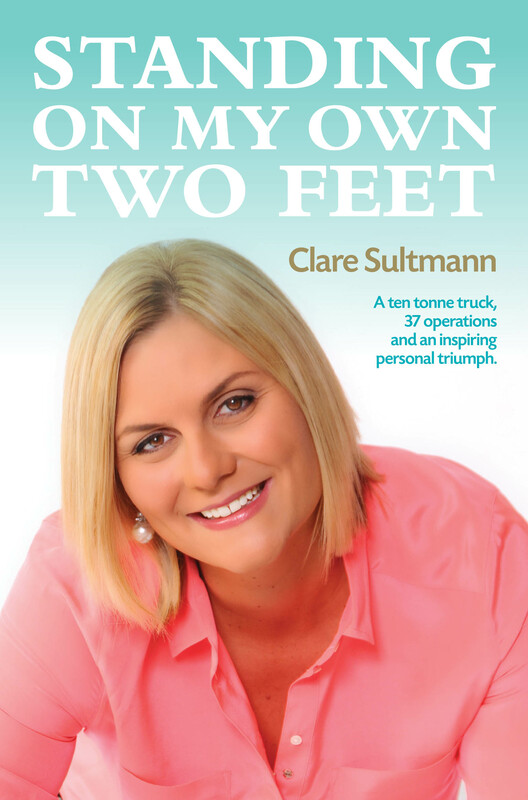 Determined that she would not only keep her legs but would one day walk again on her own two feet, Clare spends the next ten years of her life on a relentless pursuit to regain her independence. Against all odds but with great tribulation, she not only learns to walk again but discovers a deep satisfaction of life that many would aspire for. Now a married mother of two to William (21 months) and Joseph (5 months), Clare continues to face the challenges that her horrific injuries present on a daily basis with an energy and optimism that proves that nothing is impossible. Standing on My Own Two Feet is an inspiring account of how sheer strength of will and determination, alongside the care and support of those who surround us, can rewrite one’s destiny. Published by Halstead Press. All profits received by the author will be donated to Youngcare, an organisation that provides dignified housing to young people with high care needs.